Taylor's & Co. Uberti Remington® 1858 Conversion .45 Colt® Revolver. Relive the glory days of the very first large-caliber cartridge revolver! While the Model 1858 (aka New Model Army) was originally designed as a percussion revolver, Remington soon began producing cartridge conversions -- and a new era of large-caliber revolvers was born. This reproduction from Uberti brings the iconic look and top-strap design of the classic Civil War-era Revolver into the modern age. It's great-looking, great-performing, and a lot of fun to shoot. Cowboy action shooters, reenacters, modern-day gunslingers... you can't go wrong with the craftsmanship or performance here. 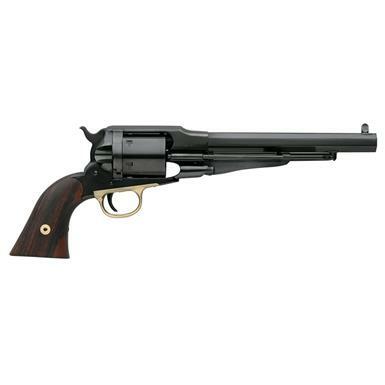 Taylor's Co. Uberti 1858 Remington Conversion, Revolver, .45 Colt, 1000, 8396650009871 is rated 5.0 out of 5 by 4. Rated 5 out of 5 by JTMa from great gun for a great price. This gun is a piece of art, and shoots great. Rated 5 out of 5 by Robert from This is my new favorite gun. I have several single action revolvers, and I'm always impressed by the accuracy of the 1858 design. Uberti did an excellent job on this .45 Colt version. The trigger is much more ergonomic than 1873 Colt style guns, and the sights were dead on right out of the box. I used this gun to take the shooting test for my concealed handgun license, and outshot a lot of the students using modern semiautos.My only real complaint is the lack of a spring on the ejector rod. I pulled the spring off another single action revolver I own and added it to this one. Rated 5 out of 5 by kccc from the fun gun i had a black powder revover like this one, but it was time consuming to reload, so when i saw the umberti conversion i jumped on it. lots of fun and no hassle, just drop spent shells out and reload like any other revolver. this gun is solid and well put together. built and looks just like a black powder revolver.